Bittersweet Enchantment: Blog Tour: Black City by Elizabeth Richards / Review + Giveaway! Blog Tour: Black City by Elizabeth Richards / Review + Giveaway! Welcome to my stop on the Black City Blog Tour hosted by Good Choice Reading. I am lucky to be part of this outstanding tour and so super excited to share with you all my review for the book. Black City is like nothing I have ever read. I truly hope my review will get you guys excited to read this wonderful debut novel. Enjoy! 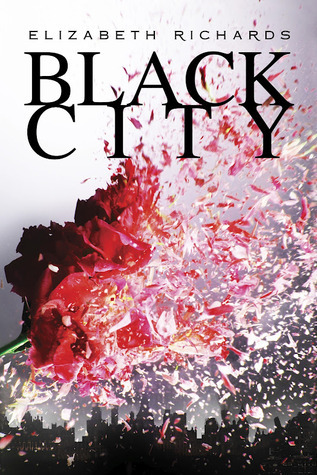 Black City is one of the most highly anticipated YA novels of 2012 and if you ask me, one of the best! To be completely honest I was not quite sure I would enjoy the book. Even though the cover is breathtaking and the plot sounded unique I felt it may just be another vampire novel. I don't know about you but I am kind of tired of vampires in books. Yeah, big shocker right? I will tell you right now I was sadly mistaken. Black City IS so much more than another vampire book, by far. 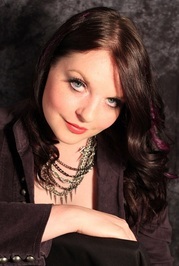 Author Elizabeth Richards takes "vampires" to a WHOLE new level, and then some. The story is set in a dark post-apocalyptic world were new creatures have emerged. Darklings (a vampire like creature), twin bloods (a mix of vampire and human) and of course humans. Humans of course are known as the superior race and live as such. This also mean they make the laws for the darklings and Twin-Bloods. Of course like any dystopian world the lesser race is not happy. They do not want to live under the human rules but to break down the very wall the separates them from each other. A teenage human girl named Natalie Buchanan who is also the daughter of the Emissary lives by these rules and tries hard not to question what she knows to be right. Although soon something or yet someone will have her questioning everything she once believed in. Ash Fisher a darkling boy, part-time "haze dealer" and all around hottie lives outside the wall and has never known anything else. Until the day he meets Natalie Buchanan and from that moment Ash's world and heart becomes alive. In a turn of events both of their lives will soon come to change. Even though they are so different Ash and Natalie will need to find the will to fight for what's right and above all else true love. For me the story was a very dark and futuristic Romeo and Juliet tale of sorts. Both Ash and Natalie have very intense relationship and the character development was spot on amazing! I felt I really got to know both of them as individuals and a couple. Now while the main characters Ash and Natalie were great I felt the secondary characters could use a bit of work. I really wanted to get to know Day and Beetle more in this book than what I did. I can see that the author does leave room for them both to grow in her next installment in the series, or so I hope. The world building was outstanding as well as the amount of action within the story. I will admit there were a few slow scenes in the book, mostly toward the beginning. All in all Black City is a excellent read which I think most of you will enjoy. Elizabeth Richards did a beautiful job of turning the overdone vampire tale into something outstanding. Black City is by far one of my favorite reads of 2012 and I can't wait until next year to find out what happens next. Here's your chance to WIN a copy of Black City and/or a pre-order of book 2 Phoenix! Just us the rafflecopter from below to be entered. Giveaway will ends Nov 30th. A HUGE thank you goes to the wonderful gals @ Good Choice Reading for hosting this awesome giveaway ! Thank you to everyone who stopped by and read my review. Leave me a comment on my review or this post and you will get 5 extra entries into the giveaway above. Dear God please let me get m hands on this beauty! Please! Great review BTW. Books books and more books!!! I loooooove books!!! "Black City IS so much more than another vampire book, by far." That sentence there is why I will pick up BLACK CITY. this book sounds interesting. i haven't heard of it before, been way to busy this year :/ anyway i'm going to go search all about it now tootles!